Hiya! Hope you’re happy and healthy where you are. It’s the cold and flu season around here and it’s been like walking acoss a minefield when I’m out and about, dodging the sneezing and coughing. Thankfully I haven’t caught anything serious. Phew! 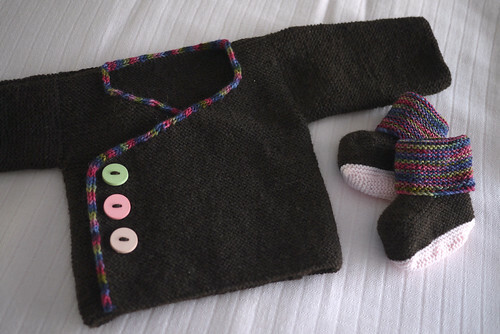 So do you remember the baby kimono I showed you in my previous blog post? Well I used the nicely wound mini skein of handdyed yarn to neaten up the edges around that baby kimono. As you can see from the photo below, the bind off edge around the neckline has left a rather ugly stair step. Yuck. We can’t leave it like that, can we? To neaten this up, I knitted an attached i-cord right around the edges. I’m not very good at remembering technical stuff so I used this attached i-cord tutorial from Purl Bee to refresh my memory. The colourful i-cord also added a much needed zing to the kimono. It is after all for a baby. And here is the finished jacket. Ta-da! A super kawaii (cute) baby kimono for my girl. Interesting fact – Did you know that kimonos are worn left over right? It doesn’t matter whether you’re male or female. They only dress corpses right over left! So take note when knitting a kimono for yourself. You don’t want to wear it the wrong way. Might be bad luck or something. 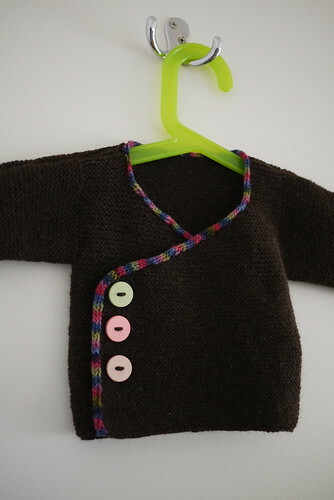 Mods: Cast on for newborn but knit length longer (1-3 months length) to make it less boxy. 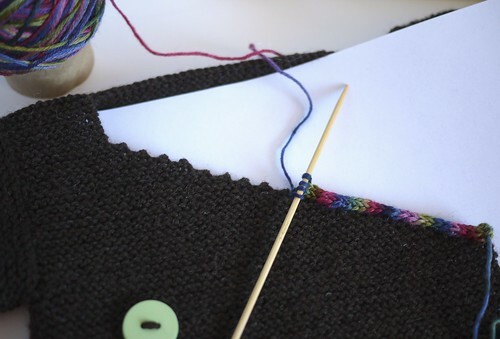 Attached i-cord edging. I had some leftover yarn from the jacket so I knitted booties to match. But there’s a bit of a story and a tutorial with those booties. So until next time, stay warm and keep on knitting!